A dustdevil is a whirlwind of air into which dust and debris gets caught up, making it visible. Dust devils form through a different mechanism than tornadoes, and are much smaller, usually only 10 to 50 feet in diameter, and usually not extending more than 100 feet into the air. They usually are seen during relatively dry conditions, when sunlight is providing strong heating of the surface, and when winds are generally light. 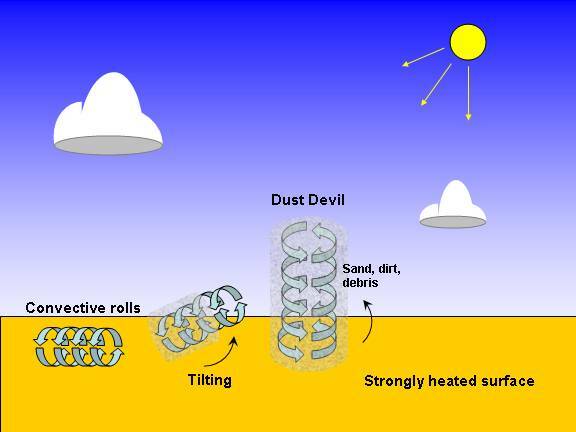 The heated land surface produces convective rolls of air (as in the diagram above) since the wind is a little stronger at (say) 100 feet in altitude than near the ground. If these rolls get tilted upright, then a dust devil can form. DUST DEVILS EVERYWHERE! : After the eruption of Mt. St. Helens in Washinton state in 1980, there was a layer of white volcanic ash deposited over thousands of square miles of land. Literally hundreds of dust devils could be observed in a single day during sunny conditions, as numerous whirlwinds picked up the light, very visible ash, forming dust devils. This demonstrates that fact that the air circulations producing dust devils are quite abundant when weather conditions are right, but they only become visible when the air circulations pick up loose debris or soil.